This is probably what the town of Kanchanaburi is best known for, built by the Allied prisoners of war the Death Railway was constructed to aid the Japanese war effort within S.E. Asia. Thousands died achieving this link through the then steaming jungle. British , Dutch, Australian, Thai, Malay all sacrificed their lives daily, working in inhumane conditions without adequate food or medical supplies. Today you can take a trip along the route as a tourist and pay your respects to those that gave their everything to build it. 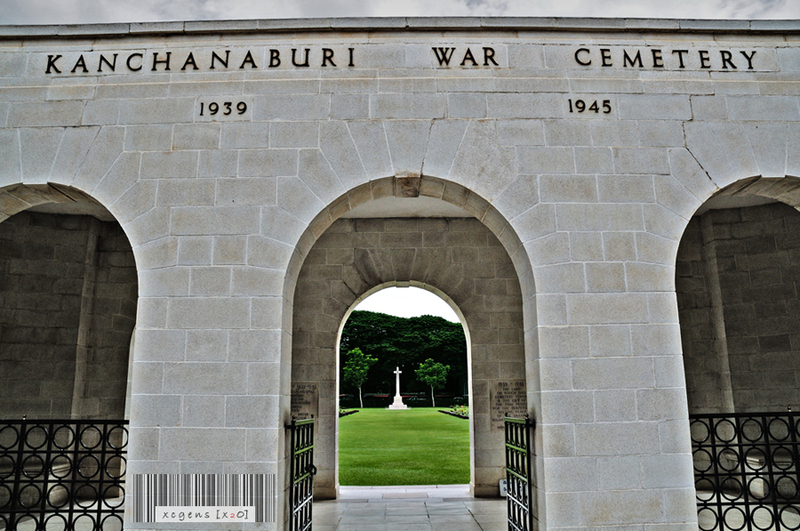 There are two Allied war cemeteries easily accessible from Kanchanaburi & both only a short walk, or bike ride away from the Blue Star Guest House. Both are a sobering experience as you walk amongst the well tended rows where the young boys and men who lost their lives in this distant place lie. Again it is worth a visit to show your respect & to reflect on how lucky we are to be able to visit this lovely country as guests & how that freedom cost so many so much. Jeath standing for Japanese, English, American, Thai & Holland. This museum is one of 3 museums within the town. This particular museum is laid out in the style of huts that the prisoners would have spent their time in when not working, and has a rich collection of paintings done by the prisoners depicting the day to day life of the camp & the hell it quite often became. There are also a large collection of newspaper interviews given by the prisoners at the time of their liberation or just after. These are what makes the place for me, read every one of them they are very, very real! In a word, WOW. 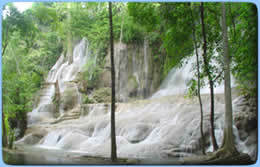 Set in the Erawan National Park this set of 7 beautiful waterfalls are a must see. 65 km from the Blue Star Guest House there are tour groups going daily, local busses, or you can rent a motor cycle & make your own way there. But you really must go! The seven sets of falls are located in a shady, forest setting. It's a 2 km trek from the first set to the seventh all through lovely scenery & relaxing pools & falls. The swimming is superb fun & the chance to swim in a forest waterfall is something everyone should experience in my opinion! 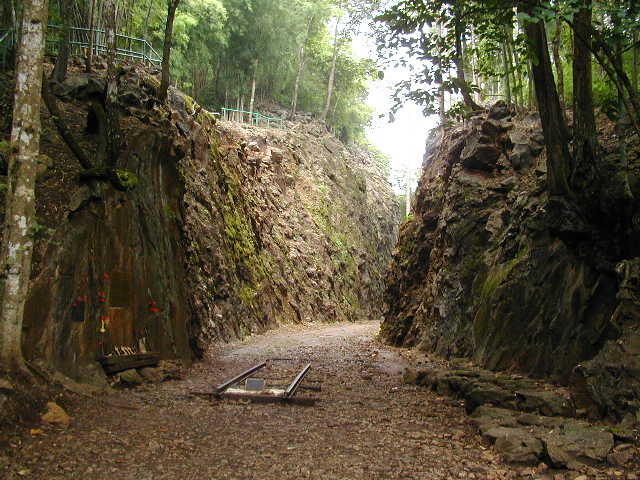 The Death Railway was built by the POW's to link the then Burma, with the existing railway system within Thailand. This was to help ship supplies to the Japanese troops stationed throughout this area during WW2. Although a large section of track is now lost under jungle there still remains a great deal of the original route from Bangkok to Nam tok that runs regular trains daily. 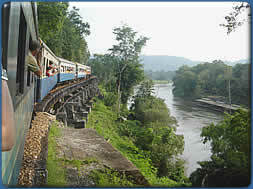 You can take a trip along this route & enjoy the Thai countryside as you travel along a piece of history. This is a very popular attraction for visitors to Kanchanaburi & combined with the museums & the war cemetery you will have experienced Kanchanaburi & it's infamous past. 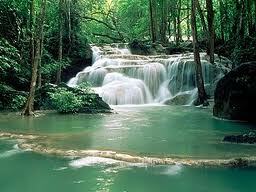 Another famous Kanchanaburi waterfall, very popular with visiting Thai & Foreign tourists. Found at the end of the Death Railway its a great destination to include when you ride the train along this infamous route. You can swim & picnic whilst your there, & enjoy the beautiful, natural surroundings. A Thai & Australian combined, Government run project set at the infamous location known as Hellfire Pass. So called as the work in this area continued 24 hrs. day & night & in the light of the fires & torches the place would indeed have looked like Hell. Many prisoners died cutting their way through this horrific location under fed & without medical supplies. The site today has a memorial museum plus they have opened up large areas of the old route for walkers to feel the history of the place. Even today it is a hot place, if you go on the walks take plenty of water & wear a sun hat. 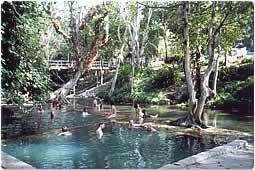 The Hindad hot springs are set alongside a tree shaded, cool river. Built to contain the plentiful hot water during WW2 by the Japanese forces these 3 pools are large enough for swimming & relaxing in. With the cool stream running just a few feet away a quick dip from the hot to the cold waters just completely relaxes every muscle in your body. Situated 30 km north of Sai Yok Yai national park & about 50km from the Hellfire Pass it is well worth a visit if your in the area. If your more adventuress & you take a motor bike trip out this way, the springs are a God send ! You can make bookings through the Blue Star Guest House to visit all the wonderful destinations shown here & many more. 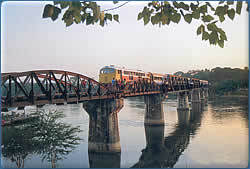 The sites listed here are just a few of the more well known sites in & around Kanchanaburi. There are a huge number of places not shown, just waiting for you to discover them for yourselves. With Tigers, caves, temples, beauty spots, parks, Elephants & much, much more you will have plenty to keep you busy in & around Kanchanaburi. It is also a great place to just chill out, the local people are friendly & will make you feel very welcome in their home town . 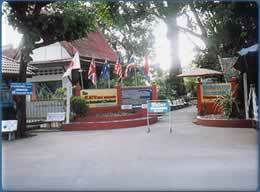 Welcome to Kanchanaburi & welcome to the Blue Star Guest House.